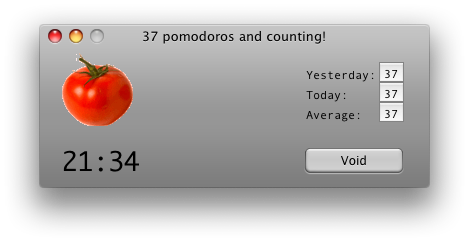 I've created 37 pomodoros with Pomodori over the past few weeks. Curiously, they are all displayed in the Yesterday, Today and Average counts. Additionally, when I click "Average" it looks like all these pomodoros would have been made on a single day, 17th of june. This is obviously wrong, as couple of the pomodoros have been made today, on 1st of July. I think you encountered a bug with timezones I recently fixed. Can you build the application from the sources? The instructions are on the main page. After building you can overwrite pomodori.app into /Applications and you should be able to see pomodoros assigned correctly. I can send you a copy by email if that doesn't work. Yes, this seems to fix it. Thanks! Cool, I'm also looking into the unicode chars issue. Keep up the pomodoro!